In large skillet, brown ground beef over medium heat 8 to 10 minutes or until no longer pink, breaking up into 3/4 inch crumbles. Remove with slotted spoon; pour off drippings. 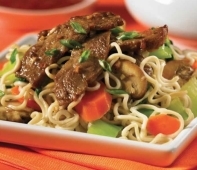 Season beef with one seasoning packet from noodles; set aside. In same skillet, combine 2 c. water, noodles (broken into several pieces), vegetables, ginger and remaining seasoning packet. Bring to boil; reduce heat. Cover; simmer 3 minutes or until noodles are tender, stirring occasionally. Return beef to skillet; heat through. Stir in green onion before serving.